A health group in Peterborough has called for IVF cuts in the city to be reversed. Healtwatch wants the Cambridgeshire and Peterborough Clinical Commissioning Group (CCG) to re-establish fertility treatment across the county after a cut by health chiefs. The CCG announced in September 2017 it was to stop routinely commissioning any specialist fertility services other than for two specified exceptions - for patients undergoing cancer treatment and for men who have a chronic viral infection. The cut was confirmed despite more than 80 per cent of respondents to a public consultation opposing the cost-cutting measure. 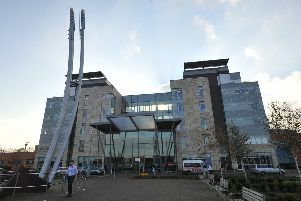 It was expected to save the CCG £700,000 a year to help it tackle a multi-million pound deficit. The CCG has committed to reviewing the decision in April this year. According to the National Institute for Health and Care Excellence (NICE), which provides national guidance, women aged under 40 should be offered three cycles of IVF treatment on the NHS. Healthwatch Cambridgeshire and Peterborough said: “At the time we said the cuts were against national guidance, would affect people on low incomes the most and may not save the planned £700,000 per annum from local NHS budgets. “The decision was taken after a 20 week consultation over the summer of 2017 which more than 1,300 people responded to. People were overwhelmingly in favour of keeping access to IVF on the NHS. Eighty-two per cent of people rejected the proposals to suspend the service. The CCG also received a petition with 2,278 signatures. “We were also concerned about the impact the cuts could have on people with fertility problems in Cambridgeshire and Peterborough. “Fertility Network UK, a charity that supports anyone affected by fertility issues, told us that in a 2018 survey 90 per cent of people told them that infertility feels like a trauma. “They said that 94 per cent say they don’t think their friends, family or colleagues really understand what they are going through in their journey to have a baby. “They also found that over a third of the people who responded had put themselves in financial jeopardy in order to have a baby. Sarah from Wisbech is 34 and was recently told that the only way she and her husband could have a baby would be through IVF. However, since the change in CCG’s policy, they are not currently able to get this treatment on the NHS. She wants the CCG to reconsider its decision as the impact of infertility on her and her husband has been immense. “It is something that you think about every single day,” Sarah told Healthwatch. “It’s not something that you can get over. It’s not something that you can forget about. It is constantly with you. “All of my friends have children. One has just announced that she’s having another one. It’s horrible, because you are so happy for them, and on the flip side you’re jealous. Sarah and her husband have looked into the options for private treatment, but this is not something they can afford. “Initially we were told its going to be £8,500. We both work hard, we both have for a long time, but who has that money lying around? I just can’t imagine not having a child, but that decision, I feel, has been taken away from me. “I can be sitting and having a conversation and then all of a sudden it will overcome me, and I will burst into tears. “The worst thing is avoiding other people’s questions. It makes people feel awkward, even your close family and friends. “It would destroy me if we couldn’t have a baby. You feel completely inadequate. We both do. Anyone wishing to share their opinions with Healthwatch can find contact details on its website.